Well, this is it. This is the story. When you think of Christmas, this is what you think of, I’m almost certain. And it evokes images for us. 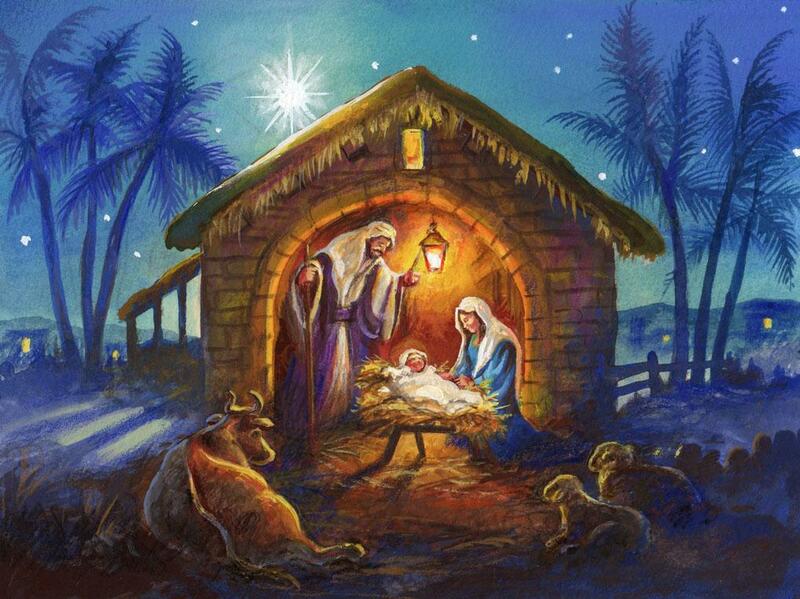 We have entire plays created around these images, the beautiful, serene image of Mary and Joseph, in the stable because there was no room at the inn, surrounded by straw and animals, a manger made of wood, the little Lord Jesus, no crying he makes. We have entire theologies created out of this image, notions of the outcast Jesus, born all alone because no one wanted to take in a poor pregnant woman. Jesus as the lone stranger, looking in from outside, always at a distance. But traveling to the Holy Land will burst some bubbles. 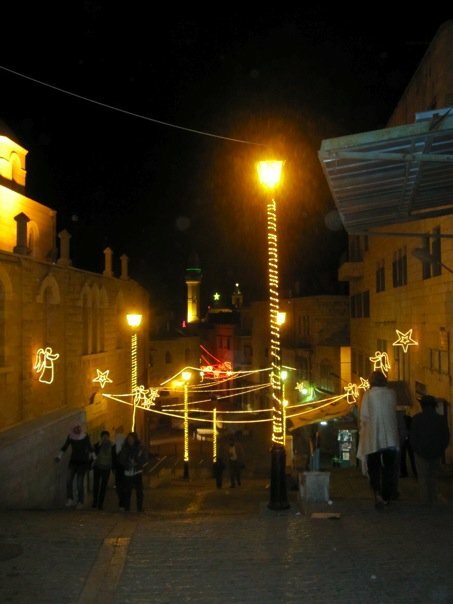 A lot of preconceptions will be trashed when you actually wander the streets of Bethlehem, especially in the care of a capable tour guide like Naim, a 75 year old Palestinian Christian, born and raised in the streets of Jerusalem. Naim had been around. In his lifetime, he has seen more than a dozen wars, firsthand. He was one of the diggers employed at the archaeological site at Qumran, when the Dead Sea Scrolls were unearthed. It was Naim who demonstrated for us the quiet hospitality that is inherent in Palestinian culture. He introduced us to family, walked across the city and back to bring us favorite delicacies, arranged conversations with people who should have been enemies, but with whom he had a polite and respectful professional relationship – people like Muslim imams and Jewish settlers. Naim had a way of tearing down the prejudices of our Western eyes, and showing us new windows on politics, relationships, economics, and our own faith. Our class of 30 seminarians easily learned as much from him and more than we did from the professor who accompanied us. And one of the most stunning things we learned chips away at this story, the story that I have known since long before I was a Christian. The Nativity story. It was so simple. All he did was show us a house. It was a house that had been unearthed during an archaeological dig next to the Church of the Annunciation, on the site where Mary learned she was to bear the Son of God, the Savior of all the world. The house would have been like every other house in first century Palestine. Almost a cave, dug down into the earth, and then built up on top with the sparse timber of the region. Two or three simple rooms, no more unless one was particularly wealthy. But for the 99%, two rooms. The front room was the family room, the space where the family ate, played, talked, slept. At night, the door was barred and the family lay down in front of it. If there were guests, they would sleep in the family room, if there was space. In some homes there was a small side room, an inn, where guests might stay. If you were traveling, you would look for relatives in whatever town you entered. However distant, hospitality demands that houseroom be given to a relative on the road. If no relatives have room, there may be a chance of staying in the inn, the guest room of a home with extra space. There are no motels, no Sheratons or Super8s. There are a few homes that have extra space. Then behind the family room, and the inn room, if there is one, there was a stable. It was a large room, lined with straw when available, where the family’s animals spent the night. Donkeys, sheep, goats, whatever they had, it was brought in at night and put in the stable room, behind the family, where it would be safe from thieves and other harm. Along one side of the room, there would be small indentations, troughs for the animals’ feed. Mangers. Mary and Joseph were travelers, a long way from home. That much is certain. But they were coming to the home of Joseph’s ancestors, the city of David, because Joseph was descended from the house of David. There would have been relatives there, people to welcome them. Maybe they arrived late, and the guest rooms were gone. But Palestinian hospitality would not send them out into some distant stable, away from everyone. Palestinian hospitality would have drawn them further into the home, into the stable at the back of the house, into the heart and the life of the family. Palestinian hospitality would have provided midwives and helpers, whatever food was available, and community for this new little family. So why isn’t that the image that we have passed down? Why have we relegated our Lord and Savior to the lonely stable? Why is Mary always so serene looking moments after childbirth? Why is the straw so clean and tidy with animals living in it and childbirth happening on it? It is a ridiculous scene, to be honest. And yet, it is nothing like as ridiculous as the birth of God, the incarnation of the Creator into this messy, dirty, broken world. We would rather believe that there is such a thing as a baby that doesn’t cry, than to believe that God would be born into the messiness that is human community. Because human community is messy. Human life is messy. And we spend a lot of time protecting ourselves from that, so it makes sense that we would want to protect God from that, too. The truth is, we don’t want to think too much about how messy life is. We ask each other the polite questions, and we give the polite answers. “How are you?” “I’m fine.” And then we can move on to the next bit of busy-ness, lose ourselves in the things that need to be done, so that we don’t have to think about the real answers to that question. Because the real answers are too hard, too painful, too messy. How are you? I’m worried about my kids. How are you? I’m scared that my marriage is falling apart. How are you? I’m surrounded by people I love and I’m still lonely. How are you? I’m sick and I don’t know why. How are you? I’m angry and hurt because of something that was said in car on the way here, something that was said in anger years ago, something that was never said enough when I was a child. How are you? I’m sick and tired of war and poverty and greed and brokenness and I want to change the world but I can’t even change my own life, and I’m about ready to give up on this messy thing called human community and go and live on a mountain somewhere. How are you? I’m ashamed. These are the true answers. The messy answers. The answers we would rather ignore if we can. The answers we certainly cannot imagine that God wants to hear, much less to experience. God, we think, wants us to be perfect. To be happy all the time, to be neat and tidy and always improving. And so we send God out to the neat tidy stable, off by himself, the lone stranger, the God who is always kept at a distance, where we can pretend that everything is fine. But if God is out there in the stable, God might as well have stayed in heaven. Paul Bauermeister is a retired Lutheran pastor. Some of you know him from his time living in Washington. He has preached here a few times. He baptized my daughter Elinor. He told me a story last week. When he was first starting out as a pastor, over 50 years ago now, he was working at a congregation in the city. It was his first Christmas there, and they were preparing for the Christmas pageant. He got the little wooden manger, just like this one that we have here. And he got a little baby doll, just like this one, to put in the manger. And when the organist saw it, she had a fit. “No! You can’t use a doll for the baby Jesus! That’s idolatry!” And Paul, not wanting to offend, said, “Okay, so what do we use?” Well, it was simple. A big flashlight goes in the manger, and you have someone sneak up while the lights are all out, and turn it on at the height of the pageant. Alrighty then. So Christmas Eve service comes, and Paul is sitting in his little pew at the side of the chancel, and the flashlight is wrapped in swaddling cloths and lying in the manger, and there is a little shepherd boy designated to be the one to turn the flashlight on at the right moment. And the moment comes, and the little boy is fumbling around in the dark in the manger in the swaddling cloths, and finally he gets it switched on, and he steps back and knocks the whole manger over, so that the flashlight goes tumbling, out of the manger, thump thump thump, down the chancel steps and out into the congregation. Which is exactly the point. God didn’t come into the world to be confined to our notions of what God should and shouldn’t be. God didn’t come into the world to be held at a distance, while we pretend that everything is fine, thank you, and paste our smiles on our faces and soldier on, proving to God and everyone just how together we’ve got it. God didn’t come into the world in order to wait in the stable until we got our house tidied up enough to be worthy to welcome God in. God came into the world to get messy. To be born in the way that all humans are born, in messiness and pain. To be born into a community, crying in the cold and hunger of the world, and comforted by the loving touch of a mother. To know and understand the hardships and heartbreaks of life, and to let us know that these, too, these, especially, are worthy of God’s attention, of God’s presence, of God’s love. This is the true Nativity story, the story of God come into the world, to redeem the world, to turn our ideas of who God is and should be on their head, and to prove to us just how much God loves us, messy and broken as we are. 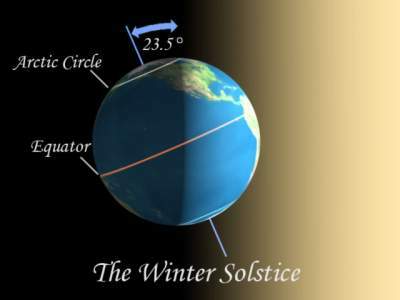 Last night was the longest night of the year, the winter solstice. It is the moment of the year when the Northern Hemisphere tips the farthest from the sun, dipping us into the cold black reaches of empty space, before spinning us ever-so-slowly back into the warm embrace of our star. So darkness is a thing that is happening. Now. Which makes this opening to John’s Gospel somehow more real, more visceral, than it usually is. I imagine that for most of you, this passage is very familiar. Many of you can even recite it from memory, or bits of it, anyway. But sometimes, in its familiarity, a passage like this can fade. It becomes background noise, no less beautiful, but a little more remote. Like a favorite song or movie that you know so well that you can do the crossword or read a book while it plays. It becomes a comfortable companion, and we don’t quite hear it anymore. And then, one day, we hear it in a different context, and the words come into focus again, and that old comfortable passage takes on new colors for us, and we reexamine it. Like when we hear, after the longest night of the year, that the light shines in the darkness and the darkness cannot overcome it. This passage reads like a hymn. It has a rhythm and a cadence to it and draws us along in the way a hymn does, circling back on itself and twisting familiar notes in new directions. But like all good music, its simplicity and beauty hide a complexity and depth that become apparent to a more practiced ear. Trust me, I am not a more practiced ear, either in music or in Scripture. For me to hear the layers of complexity concealed in this introduction to John, I need a guide. Fortunately, my dad gave me one for my birthday, a 1200 page commentary on the Gospel of John by Frederick Dale Bruner. Don’t worry, I’m not going to delve into the whole thing here today, but I think it will come in handy over the next few months. Since we are following the Narrative Lectionary this year, we are going to have a very unusual opportunity, one you never do get when you are in the common lectionary. We are going to walk through the Gospel of John together, in narrative order, from now until Easter. We will listen together to the story of Jesus according to the fourth gospel, a story that we usually only hear in bits and pieces, spliced into three years, in between the stories of Matthew, Mark, and Luke. I hope it will be a fruitful time for us, and I plan to make good use of that 1200 page commentary. But for today, I just want to point out a few things. Because this, today, is John’s overture. It is his chance to lay out for us what is important to him, and he does this with a hymn. And to understand the hymn, we have to zero in on a few notes. In the beginning… Well, already we’re in familiar territory. These three words, in the beginning, elicit a response from us, they take us back to another story that starts with these words. It is the story, the story of Creation, the story of Genesis. It takes a good bit of audacity to start a book this way, setting your story on a par with the Book of Genesis. But for John, it is not his story, it is God’s story, and he wants to make clear to everyone who reads this or hears this, that Jesus Christ is the story of creation. This is not a new story. This is the story of what God has been up to all along. And what was in the beginning was the Word. Which we know from that other story, because what that story in Genesis says is that God was there in the beginning, and then God spoke. And God’s speech does something. God’s speech is powerful speech. It is speech that changes things, that shakes things up, that makes things happen. Which is what we are led to remember when John tells us that God was there in the beginning, and God’s Word was there in the beginning, a part of God, and all things came into being through this Word. Without this Word, John tells us, not one thing came into being. Not one. Not the sun, not the stars, not the seas or the mountains. Not me. Not you. You exist, you live, you came into being, through the Word of God. Life itself. What has come into being in the Word is life itself, and the life is the light of all people, of all human beings, it says in the Greek. And again, we hear echoes of the first story of Scripture, because the Word of God spoke into the chaos of the beginning, and the first speech of God that we have recorded there is, “Let there be light,” and there was light. And now we learn from John that all of God’s Creation is life and that life is light. But there’s more, because the true light, the light that actually is the Word of God, was coming into the world. No longer content with just creating the world, the Word is coming into the world. And the world is a nasty place. You don’t need me to tell you this, I know. But I just want to make sure you’re clear about where John is coming from here. The world, whenever you hear it in this Gospel, the world is the thing that works against and rejects God. It is the cosmos, the chaos, the darkness. It is the place that no one in her right mind would go, if she had a choice. And it is the very place that God chooses to go. Because the world is not only that which works against and rejects God, it is also the thing that God loves more than anything else. For God so loved the world. What that really says is, for God so loved the God-rejecting, God-hating world. What this book of John is, in many ways, is a love story, the story of a jilted lover, this love-sick God, who loves this world so much and is utterly heartbroken by how much this world rejects God’s love, and God tries over and over again, through the prophets and through the law, to show the world God’s love, and still the world rejects God. And finally God doesn’t know what to do, except to throw it all in with the world and become a part of the God-hating world. It’s almost like the plot of a bad romantic tragedy, the jilted lover who says, look! I’ll show you how much I love you! I’ll die for you! And that’s what God does. God comes into the darkness and allows the darkness to overwhelm, to win, because God loves this world that loves the darkness. 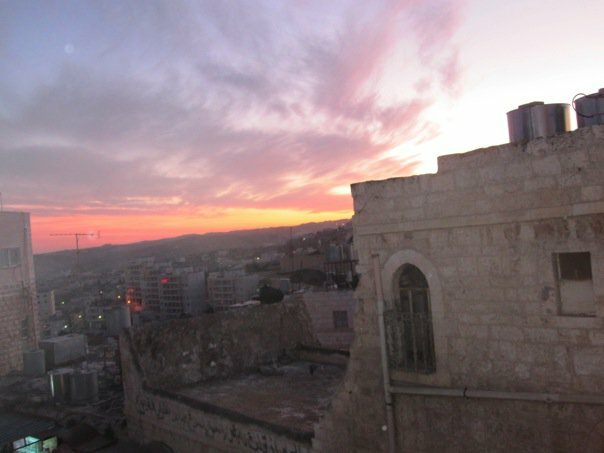 Bethlehem is an old, old city. Older even than Jerusalem. The streets of Bethlehem are a maze of cobblestones and bricks, patched together with cement. The walls of the buildings rise straight up and even hang over the streets, and little alleyways jut off at odd angles and in surprising places. As you walk the streets, you think there is no way that motorized vehicles can fit through these narrow passages, and yet there they are, inexplicably carrying every kind of thing to the merchants who line the streets, raisins the size of half-dollars, melons grown in the desert, scarves, shoes, baklava, chestnuts to roast on open fires. Seriously. So the first thing you want to do when you arrive, is to go for a walk and experience these streets. After you take a nap, because you are jet-lagged. So you look at the streets from your hotel window, and then you nap, and you wake up and it’s dusk, and time for dinner. You all decide to eat, and then go for a walk. By which time the sun has set. But Manger Square is only a half-mile away, you’re told, so you decide to go anyway. And you set off. The streets are fairly well lit in this part of town, and your group straggles out, walking in twos and threes, taking in the scenes of merchants closing down for the night. And then, quite abruptly, everyone stops. Because there is no light in this part of town. For the next hundred yards or so, there is no light. Not a single drop of electricity. No candles. Nothing. Who knows why. Perhaps these people are too poor to pay for electricity. Perhaps this part of town is being punished for some crime. Perhaps they are waiting for unsuspecting and stupid tourists to walk through here on their way from the Lutheran guesthouse to Manger Square. Whatever the reason, it is dark. Pitch dark. And so you cluster together for safety and for something to cling to, and you inch your way through the darkness, feeling the walls with your hands and the cobblestone steps with your feet, and then, just as suddenly as it began, it ends, and you are in the square, surrounded by Christmas lights and neon-lit mosques and groups of people enjoying roasted nuts, and it is hard to remember the darkness and the fear it brought. You don’t have to go so far as Bethlehem to be afraid of the dark. We are in it. And our fear of the dark is less about the darkness itself than it is about what we know of darkness. The darkness of human hearts. Darkness that would put one group of people behind a wall because of centuries of fear and persecution suffered by another people. Darkness that would force some to desperate measures because they do not have enough, cannot get enough, to feed and clothe their families. Darkness that would drive people to despair, that causes some to live with mental illness, addiction, depression. Darkness of war that leaves its mark on the earth and on the hearts and minds of people who have lived it. We are afraid of the dark. Because we know it. Because, sometimes, it lives in our own hearts. Because we have brushed up against it, in our grief, in our pain, in our shame, in our regrets. 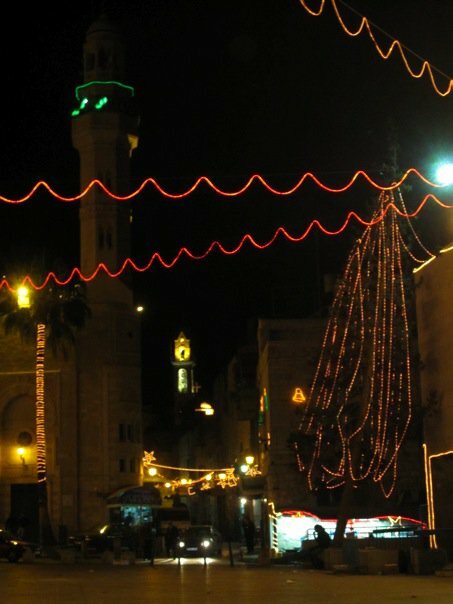 Bethlehem is where the light came into the world. It is the physical location, the place where you can actually touch the spot where the light came into the darkness. But the light didn’t stop there. When God came into the world, when the Word became flesh, what came into being in him was life, and the life was the light of all people. God came into the world, came into the darkness, and darkness cannot recognize the light. People did not recognize God’s Word, even when they stood before it, and they poured their darkness on the Word. But the story doesn’t end there. Over the next few months, we will walk that story. The story of how the light shines in the darkness. How the light continues to shine, it shines on, and the darkness is nothing to it. The darkness rolls back before it. For our sakes, God comes into the darkness, lives in the darkness, gets to know the darkness as we know it. But for our sakes, the light shines on in the darkness, and the darkness will not overcome it. Darkness never has the last word. The earth, created as it was in him and through him, the earth will move forward, and will turn back towards our sun, the star at the center of our solar system. We, created as we were in him and through him, we will be drawn forward. You, created as you were in him and through him, you will be drawn into God’s promised and preferred future, where you will live in the light of the Son, the Word made flesh, the Bright Star of Bethlehem. My 3-year old daughter Elinor has had a bad week. On Sunday night she overheard a conversation between her dad and our older kids about death. And it hit her hard. I guess it had never occurred to her that life is a temporary thing, and being 3, she doesn’t really have a strong sense of time. While her father and I assure her that death is a long way off for us and for her, she doesn’t understand that. There is no difference in her mind between a long way off and right now. It’s all the same, and it’s all scary, and she does not like it one bit. She has been extra clingy, sitting on our laps every possible moment, not wanting to go to school, not wanting me to go to work, just generally displaying symptoms of angst and having an all-around existential crisis. And while I have been doing everything in my power to console her and help her feel safe and loved and, well, permanent, I can’t help but agree with her and feel like maybe it would be best if we all refused to leave home, and just curled ourselves up on the couch under a huge pile of blankets and maybe a cat, and just stayed there, safe and warm, and permanent-feeling. Because the truth is, I think we all feel that anxiety somewhere deep down. Our ability to get up and walk around in the world and pretend that we are permanent fixtures on this earth is a learned thing. Somewhere along the way, we have figured out a way to cope with our impermanence, with the fact that everything in the world is temporary, and everything and everyone does in fact die. Usually sooner than we’d like. Somehow, we learn to stuff that truth down deep and we put on a brave face and go on about the business of life. And that’s mostly a good thing. But then something happens and we come face-to-face with the truth of the world, and we are forced to deal with our mortality. With the mortality of those we love. Someone dies, and we find ourselves alone. Someone gets sick, and the specter of life without them begins to loom. 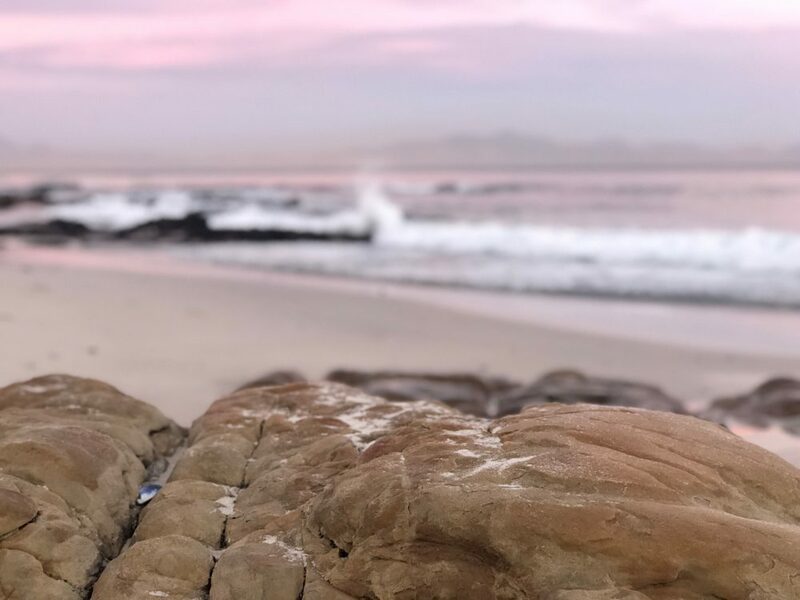 Depression moves in, and we cannot shake the feeling of despair, of hopelessness, of being overwhelmed by the sheer size of the world and the problems it carries. And somehow, this time of year seems worse. This season when the whole world is conspiring to remain unerringly cheerful, even as the very light outside is fading. Even as we are stuck in the drear tones of twilight and snow, our society steadfastly refuses to acknowledge that anything will ever die, and instead it gorges itself on excess, festive lights, sumptuous feasts, bright tinsel colors, and piles and piles of stuff from a store, all designed to help us feel like we have control, like we are somehow in charge, like we and those we love will always be here. And for those of us who know the truth, for those of us who are mourning, grieving, depressed, or in pain, it only makes it worse. It only gives the lie to season’s festive falsehoods. “Come to me, all you that are weary and are carrying heavy burdens, and I will give you rest.” Who among us is not carrying heavy burdens? Who among us is not weary? The whole world is weary, it seems, and just trying so very hard to pretend that it isn’t. And we seek to medicate our weariness with more caffeine and adrenaline and busyness, in hopes that no one will notice just how weary we really are. But God notices. And God is not willing to leave it up to you to fix it. Come to me, says God, you will find rest for your souls. As Elinor has been working her way through this realization that everything is temporary, she has been clinging to me. I think it’s almost instinctual, that she clings to the source of her existence, the place where she began, and so she seeks me out, because if I’m real, then she’s real, and if I’m here, then she’s here, and it relieves that fear and anxiety, if only for a moment. But I know that, whatever I tell her now, I will not always be there for her. I, too, am temporary. And so I find that it is my job to remind her of the true source of her being. And when she gets most anxious, or when I have to leave her at school, or at home, or at bedtime, we pray a little prayer together, and I give her a blessing. I make a sign of the cross on her forehead, and I remind her that she is a child of God, and that God loves her very much, and that God will never, ever leave her, no matter what. And I can feel her relax, just a little, and I go, leaving her in the very best care. And that is what we really are celebrating in this dark season. Even though crass commercialism tries to co-opt the festivities for its own purposes, the lights that we hang are not just our way of ignoring our mortality. If we pay attention, they are a way of celebrating. A way of reminding ourselves that, no matter how dark it gets, there is a light shining in that darkness. There is a God who comes to us, who seeks us out, in the bleak midwinter of our lives. There is a God, the source and ground of our being, who come to us in spite of everything, and claims us as God’s own child. There is a God who has created us, and who delights in that creation, and who is ready to comfort us, and carry our burden for us, and give us rest for our weary souls. There is a God who makes sure that darkness is not the whole story, that our fears do not rule us, that death is not the final word. Maybe you need reminding, as Elinor does. Maybe you are lonely, or weary, or sad, or tired. Whatever your need, you are invited to come forward and receive a blessing, and to carry that blessing with you as you leave, as a reminder that you are never, ever alone, no matter what. I am fortunate enough to have a complete family tree for both sides of my family that takes me back to the first immigrants to have arrived here from the Old World. On my mother’s side, my family have lived in the Piedmont of North Carolina since around the Revolutionary War, having arrived on these shores in 1727, lived in indentured servitude, and then settled there on being released. I was born in Charlotte, North Carolina, in the same hospital that my mother was born in, and lived for my first 5 years in Mecklenberg County, the same county that my McLain ancestors have lived in for almost 3 centuries. My father’s people were Moravians who settled in the Ohio river valley with a land grant for their service in the Revolutionary War. They lived there through the Civil War, were abolitionists, and fought on the side of the North. In the generation after the Civil War, they moved south, into Alabama, where they lived for two and a half generations. My great-grandfather was a carpetbagger who married a local Alabama girl, converted to her Presbyterian tradition, and settled. His son, my grandfather, married an orphan girl from Mobile, my grandmother, and they settled in Prattville, just north of Montgomery, where they raised 6 children, all of whom left Alabama, settling from Minnesota to Mississippi. None of them have ever thought to return to Alabama, much less Ohio. Two and a half generations, and they were dyed-in-the-wool southerners. They were still abolitionist at heart, and fought for civil rights when the time came, but they all have southern accents, a southern sense of time and propriety, and a southern cookbook for comfort foods. Most of them still live south of the Mason-Dixon line, and not one of them has ever returned to Ohio, as far as I know, not even to visit. Two and a half generations is a long time. That’s how long it’s been for the Israelites. Two and a half generations, more or less. Seventy years. About the same amount of time between my carpetbagging great-grandfather, and the birth of my aunt Sarah. It’s more than enough time to settle in, to become comfortable, to establish yourself. Jeremiah told the exiles when they first arrived, “take wives and have sons and daughters and take wives for your sons and husbands for your daughter, that they may bear sons and daughters; multiply and do not decrease.” And they did. They married, they had children, they set up homesteads, they found themselves work, they became a part of Babylonian society. And they were actually pretty comfortable by the second generation. The Babylonians were not cruel. They didn’t force the Israelites to abandon their God, though certainly there were pressures in that direction. But for the most part, the Jews continued to worship as Jews even as they began to look and act like Babylonians. Who knows how many intermarriages there were? Certainly a few, as the story of Esther tells us; the story where the main characters, Esther and her cousin Mordecai, have names derived from the names of Ishtar and Marduk, the chief gods of Babylon. And it’s hard to think of more Jewish names than Esther and Mordecai. So you see how assimilation happens. How it doesn’t take long. Two and a half generations is all you need, and bam, you’re more Babylonian than anything, except that you worship the Hebrew God. And then the Babylonian empire is defeated by the Persians, and king Cyrus, the new ruler, comes along and says, hey, why don’t you guys head on back to Canaan now. Off you toddle, back to the promised land. G’bye now! But the people aren’t so sure they want to go. Going will be work. The city of Jerusalem has to be rebuilt. The fields have not been used for 70 years, so there will be olive groves and vineyards to restore and replant, fences to rebuild, wells to redig, houses to build, roads to clear. Work. Why would you sign up for that when you have a perfectly comfortable living where you are? Friends and family you know, fields and workshops and houses already established. And yet. You have heard about this promised land all your life. This is the land of your ancestors, the land of your God. This is where Mt. Zion is, where God spoke to Abraham and spared Isaac. This is where Bethel is, where Samuel heard God speak in the watches of the night; where Bethlehem is, the City of David and Ruth and Boaz. This is where the River Jordan flows, where Elijah was fed by raven and brought down the fires of God from heaven. How could you not go? This is the tension that Isaiah 55 sits in. The tension between practical considerations like the life that stands in front of us, the debts we owe, the land we own, the life we lead, and the promises of God, promises for abundance and relationship. The tension between what we see and what could be. It’s a tension familiar to us. In big ways and small. The tension between shoring up our sense of security, and trusting in God for comfort. The tension between filling our lives with things, money, power, stuff, and trusting that God will fill us with purpose, with meaning, with mission. The tension between what our eyes tell us is fact, and what God tells us is true. And so the prophet tries to entice them. He offers promises of feasts and abundance. Nelson’s family arrived in the United states from Sweden in the late 1800s. It was his grandmother’s grandfather who immigrated, and they still have a strong sense of being Swedish. But I don’t think they’d be quick to run back to Sweden to live. Unless you told them that Swedish meatballs roll down like waters and rice pudding like an ever-flowing stream. The promise of a feast makes sense. It draws us in, and encourages us to break the tension in favor of God’s promises. But we do have that stubborn practical streak, and we are more inclined to believe the evidence of our eyes than the promise of things we’ve never seen. But we live in a desert, reply the people of exile. There are no waters. But we live in a world of scarcity, reply the people of today. There is not enough water. We have to buy our water. It costs money to clean it and reclaim it and bottle it and shop it and sell it. The World Health Organization recommends 100 liters of water per day per person for the basic needs of consumption and hygiene. The average person in the city of Bethlehem has access to only 73 liters per day, and less in the summer. Other parts of the West Bank have as little as 37 liters per day. Average daily access just a few miles away in Israel is over 200 liters per day. You that have no money, come, buy and eat! Come buy wine and milk without money and without price! But we live in a world where you have to have money, you cannot buy and eat if you don’t have money! It takes money to make money, we’re taught. Our world is one where you have to work to earn, and we have convinced ourselves that if there are people who do not have, if there are people who are poor, or who are outcast, or who are marginalized, it is because they deserve it. They have not worked hard enough, they have not behaved properly, they have not earned their way to wealth, to health, to respect. This is not a world where people without money come, buy and eat. But my thoughts are not your thoughts, nor are my ways your ways, says the Lord. It is time to come to the feast. It is time to return to the promised land. It is time to leave behind the false promises of the world. Promises of abundance in the form of things. Promises of love that dehumanize individuals and reduce them to objects to be desired. Promises of joy that come from a bottle. Promises of satisfaction that ultimately ring hollow, as the immediate payoff dwindles and the emptiness returns and we are left looking for another hit, another jolt, another titillation, another new toy. My ways are not your ways, says the Lord. God does not promise as the world promises. in God, the promises seem small. Minuscule, even. They don’t make sense in a world where maximum flash, maximum effect, are expected. Who would believe that God would come into the world? Much less as a baby, born to a homeless, unwed, teenage mother, in the most backwater powerless corner of the Empire? We look for our gods in megamalls and on red carpets, not in mangers and among shepherds. Who would believe that God would provide all we need for free? We look for our satisfaction in the priciest places, in the aisles of abundance, in the gorging feasts of decadence. Who would believe that God would die a criminal’s death in order to defeat the powers of sin and the grave? We look for our heroes in spandex and spangles, in weapons and wizardry, in violence and victory. Yet here is our God. Born as a child, born to a simple peasant woman. Here is our God, living a life for others, dying a death for others, a death of humiliation and defeat. Here is our God, in the simple bread and wine of a shared table. A tiny little wafer, a tiny little sip. And it’s no wonder we don’t believe it. It’s so very little, compared with the beckoning plenty of the world. It’s such a drop in the bucket, next to the vats and barrels and reservoirs that the world promises us. And yet this tiny little bit is enough and more. This tiny little drop is enough to overwhelm the tides of the world, and to shift us into a new future. Into a new worldview. Into a new way of being. Would you feel it any more if I gave you a bigger piece? If I placed a roll in your hand, or a loaf, and said, “This is the body of Christ, this is the very body of God, sitting in your hand, and you are invited to take that whole thing into your own self and make God a part of your life, to consume this loaf, and to allow this body of Christ to satisfy and fill that hole inside you that nothing else can”? Would you believe it any more then? With God, even the tiniest bit is enough. The tiniest spark of light overcomes the darkness. The tiniest bit of hope overwhelms despair. God’s word does not come back empty. Like the rain and snow waters the earth, God’s Word nourishes us and brings forth new growth. A new way of being. God’s Word draws us into a future that relies on God. So that whether we stay here in Babylon or go back to the promised land, our future is in God’s hands.